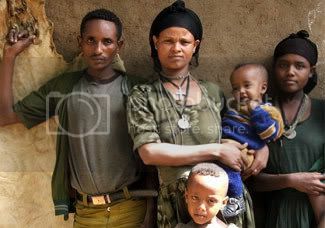 A Falash Mura family waiting in Ethiopia to immigrate to Israel, in a 2005 photo. But advocates and some federation executives suggest Israel’s move is just a feint, meant to distract supporters of Ethiopian aliyah from the fact that Israel still has not followed through on its March 2005 commitment to accelerate Ethiopian aliyah to 600 people per month. The current pace is 300 per month, although — until the recent backtrack — Israel had decided to cut it to 150. In September, as part of the government’s proposed 2007 budget, Israeli officials suggested halving the monthly Ethiopian aliyah from 300 to 150. However, on the eve of the Knesset vote last week that approved the budget, the director-general of Prime Minister Ehud Olmert’s office sent a letter to the United Jewish Communities federation umbrella group, saying the plan to cut Ethiopian immigration had been dropped. Stephen Hoffman, president of the Jewish Community Federation of Cleveland, said the government’s continued stonewalling on previous decisions to accelerate the aliyah betrays a philosophical difference about the value of Ethiopian immigrants. Last week, both federation leaders and the Jewish Agency for Israel, which is in charge of the immigrants’ aliyah and absorption in Israel, sought to take credit for the government decision to maintain the status quo. “If the government didn’t change its policy to cut the aliyah, it’s because of the lobbying of the Jewish Agency,” agency spokesman Michael Jankelowitz said. He pointed to an Oct. 24 meeting between Olmert and Jewish Agency Chairman Zeev Bielski, among others, as key. But Robert Goldberg, chairman of UJC’s board of trustees, said federation lobbying did the trick. A UJC fund-raising campaign, Operation Promise, aims to provide $100 million for Ethiopian aliyah and absorption over the next few years, some of it channeled through the Jewish Agency. “It is clear that pressure brought to bear by our federation leadership — by you — has played a critical role in this decision,” Goldberg wrote to supporters last week. There is some debate about how many eligible aliyah petitioners remain in Ethiopia. Most estimates put the population at 8,500-14,000, but independent media investigations have found that there may be thousands more Falash Mura living in the countryside. Falash Mura are Ethiopians of Jewish ancestry whose progenitors converted to Christianity several generations ago to escape social and economic pressures. In recent years they have been returning to Judaism — a bid, some say, to emigrate to the Jewish state along with their extended families. Most have moved from their rural homes to shantytowns near Jewish-run facilities in the Ethiopian cities of Addis Ababa and Gondar while they wait to emigrate. Every month, approximately 300 are brought to Israel by the Jewish Agency. Once here, they’re given housing, education and job training. Nevertheless, many find it difficult to climb out of poverty, and many Ethiopian Israelis live on welfare in one way or another. The average Ethiopian immigrant costs Israeli taxpayers roughly $100,000 over the course of his or her lifetime, according to government estimates. Observers say that’s partly why the government has dragged its feet for years on implementing successive Cabinet decisions to speed up Ethiopian aliyah. The original Cabinet decision to expedite the Falash Mura aliyah was taken in February 2003, when Ariel Sharon was prime minister. Doron Krakow, UJC’s senior vice president for Israel and overseas affairs, said federations will continue to press Israeli officials — including those in the United States this week for the UJC’s General Assembly in Los Angeles — to follow through on the pledge to expedite Ethiopian aliyah. Jankelowitz, the Jewish Agency spokesman, said it doesn’t much matter whether the rate is accelerated to 600 immigrants per month or not.